Suzlon Energy, the wind turbine major, has big plans in China, though these may take some time to put through. These include a research and development centre and listing its Chinese subsidiary, Suzlon Energy (Tianjin) Ltd, on the Hong Kong Stock Exchange, in a few years. The move is to take advantage of the local market and increase localisation to compete with Chinese rivals, news reports from China said on Monday, quoting Suzlon's chairman and managing director, Tulsi Tanti. He was talking to reporters on the sidelines of the World Economic Forum meeting in Tianjin, China. There are medium-term plans to list the Chinese subsidiary, but Tulsi Tanti did not specify any time frame. 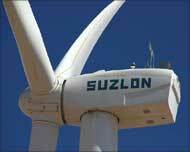 Suzlon is the world's largest wind energy turbine maker and is listed on the Bombay Stock Exchange. It is yet to finalise location and size of investment for the R&D Centre, said the reports. A few weeks earlier, it had opened a new R&D centre in Germany. It also has one at its Pune headquarters. Present in China since 2006, it is the eighth largest wind energy company there. China added 13.7 Gigawatts (a Gw is 1,000 Megawatts) last year and with an installed capacity of 25.85 Gw of wind energy, is one of the fastest growing markets in the world. The annual growth rate is 115 per cent, said Suzlon executives. They declined to reveal the size of annual revenues from China. Suzlon has a manufacturing unit in Tianjin and a marketing office in Beijing. It employs about 800 people in that country. Its subsidiary, REpower, in which Suzlon holds over 90 per cent stake, has an assembling unit in China and employs 100 people in that country. Suzlon's installed capacity in the country is 530 Mw, said a company spokesperson. He said REpower, a specialist in making offshore turbines, was exploring a joint venture to make these in China with a local partner.